About twenty miles from the Chesapeake Bay Bridge Tunnel, we turned right from Route 13 to Route 184 to explore the bay side town of Cape Charles on Virginia’s Eastern Shore. For many years the town had been the terminal of the Little Creek Cape Charles Ferry, which provided car ferry service to Norfolk and Hampton. Now an expansive beach runs the length of the village. Many of the homes date back to the early 1900s, and the town center has a distinctly small town main street. Upon leaving the town, we drove by the filling station pictured above. A sale sign poked out of the tall grass. Even in the state of disrepair, the little building conveyed a charming ambiance so we stopped to take a picture as it seemed that its future was somewhat precarious. After some research, I learned that during the 1910s filling stations were fairly standardized, but beginning in the 1920s oil companies began pushing to make their product easily identifiable, leading to a variety of architectural styles for their stations. In 1926 the English cottage design became the trademark of the Pure Oil Company. These quaint cottage buildings were intended to appease neighbors, as unsightly gas stations were considered an undesirable addition to communities. The Pure Oil Company painted their stations white and topped their steeply pitched roofs with characteristic blue enameled terra-cotta. Arched entrances, bay windows, ironwork and sometimes flower boxes gave these structures a Tutor look. Only the pumps out front identified the building as a service station. Carl A. Peterson, responsible for the design of these stations, became head of the Design and Production Department for Pure Oil in the mid-1920s. The company continued to use his design until just after the Second World War. Some of these stations have received historical designations, such as Freitag’s Pure Oil Service Station; but unfortunately, most have been torn down. In Wilmington, Delaware, a monument to Peterson’s work stands at Market and Seventeenth Streets, on the edge of the historic district. Phillips 66 and Cities Service stations adopted variations of Peterson’ popular style. 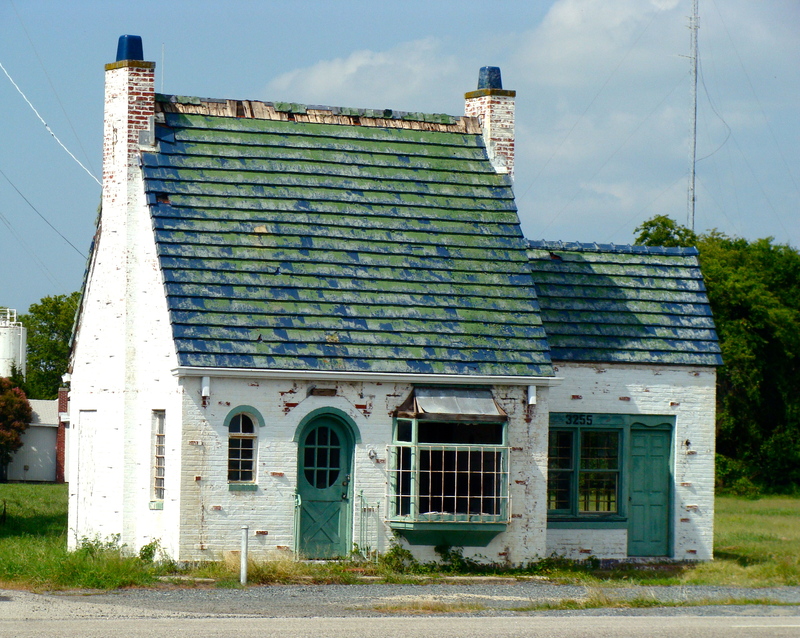 Standing by itself, one of these stations still remains on Route 30 in Devon here. I’ve seen two others in the Philadelphia area, one in West Philly on the corner of Whitby and 52nd Street and another, converted to selling Italian ice, located in Upper Darby on Garret Road. The Pure Oil Company has another local connection. Securing its name in 1895, the company finished its crude-oil pipeline from the Pennsylvania oil fields to deepwater terminals across Pennsylvania. In 1901 before the pipeline was completed, the company built a refinery at Marcus Hook, PA, to process the company’s crude. What triggered my nostalgia for this filling station is that my mother worked for a time in an office in a gas station that had similar architecture. Located near the corner of City Line and Lansdown Avenues, we would often drive by the station; and my parents would remind us of Mom’s time there. I always admired the structure with its rust-colored tiled roof and rounded door. The station has long since disappeared from the landscape, but when we drive pass that corner, the ghost of the building still stands in my mind.